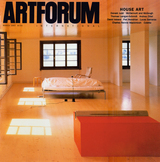 CRITICS IN THESE VERY PAGES have bemoaned that furnishings made by artists—Judd and Flavin were mentioned, Scott Burton could have been—are being carted out of their art stores and into other salesrooms of fashion. But that’s the problem with a chair in a gallery: someone will always sit in it. Andrea Zittel may have started to construct furniture out of youthful “necessity,” feeling her jigsaw oats, but soon she understood home furnishing as an art medium, like acrylic. She made her beds, so why shouldn’t she lie in them? If galleries are salesrooms, studios can be showrooms, and Zittel has interpreted her Brooklyn house as a testing environment for her line of A–Z furniture. Luxuriously finished ottomans may be used serially or simultaneously as beds, tables, couches, storage, and . . . sculpture (this versatility was the ’60s promise of the milk crate, knocked off but never treasured).